Revisiting Rosacea Criteria: Where Have We Been, Where Are We Going, and How Will We Get There? 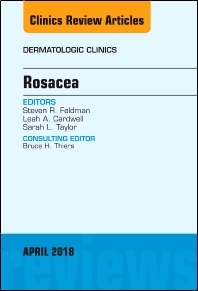 This issue of Dermatologic Clinics, guest edited by Drs.Steven Feldman, Leah A. Cardwell, and Sarah L. Taylor is devoted to Rosacea. Articles in this issue include: Rosacea Pathogenesis; Genetic Predisposition to Rosacea; Epidemiology of Rosacea and Severity in the Population; Psychosocial Burden and Other Impacts of Rosacea of Patients’ Quality of Life; Comorbidities of Rosacea; Rosacea Triggers, Alcohol and Smoking; Clinical Presentation/Classification of Rosacea and Variation in Different Fitzpatrick Skin Types; Rosacea Treatment Review; Medical Management of Facial Redness in Rosacea; Procedural Treatments for Rosacea; Ocular Rosacea; Rosacea Treatment Cost; and Coping with Rosacea.